Most people recognize the Calvin Klein brand with its simple style that is high quality and sophisticated, without being fussy. The brand has numerous different lines and has translated its chic, minimal aesthetic into everything from eyewear to shorts. 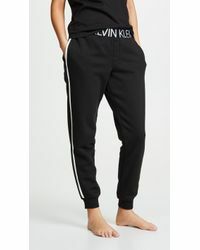 The line of sweats from Calvin Klein is relaxed and yet stylish. 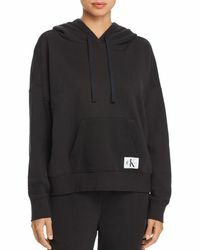 The range includes branded logo sweats, velour hoodies and striped zip-up sweatshirts, as well as smarter, long-sleeved textured tops. 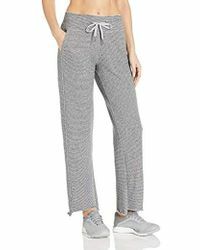 There are cozy cocoon cotton blend jersey sweatshirts and sweat pants that range from simple jersey trackpants in the brand's signature gray, through to harem pants and lounge workout pants.